Kashmir exploded last fortnight as terrorism-related incidents hit a new high. The government of Jammu and Kashmir fell after alliance partner, the Bharatiya Janata Party, pulled out of the coalition. Just a week or so before this, the Prime Minister brought into focus another conflict zone, the Maoist-affected Bastar in Chhattisgarh. He inaugurated an airport in Jagdalpur saying it would bring fast connectivity to the region. The Prime Minister said there would be an economic windfall and the region would go against the extremists. Both conflict zones suffer from extreme underdevelopment: Bastar is one of India’s poorest regions, while Jammu and Kashmir has over 20 per cent population under the poverty line. And it is a widely accepted argument that poverty has contributed to jobless youth taking up guns, or joining extremist organisations. This debate has two aspects—whether poverty plays an important, if not sole, role in driving the youth to extremism; and, whether extremism, or in general parlance conflict situations, lead to poverty. In either case, there is a growing sense that poverty eradication has to be an instrument to douse or to avert conflict situations. Last year, the theme of the International Day for the Eradication of Poverty on October 17 was “A path toward peaceful and inclusive societies”. This indicates the importance of poverty in dealing with conflicts, both as a trigger or as a resultant. This came just after the release of a landmark survey by UNDP on reasons that drive young Africans towards violent extremism. The survey sample included 500 “former—or in occasional cases current—voluntary recruits to extremist organizations” such as Al Shabaab, Boko Haram or Ansar Dine. They were asked about the triggers for joining such organisations. And very few mentioned religious ideology while a majority cited lack of employment, healthcare, education, security and housing. “Numerous studies show that increasing inequality hinders economic growth and undermines social cohesion, increases political and social tensions and drives instability and conflict,” the report said. On the other hand, conflicts are leading to more poverty thus setting in a vicious cycle. In June this year, when UN took stock of the progress of the Sustainable Development Goals, it found that for the first time in a decade the number of hungry people had increased. And this is due to climate change-induced disasters and conflicts. “Progress has been hampered by climate change-related extreme weather and by violence and war,” said Francesca Perucci, assistant director of the Statistics Division at the UN Department of Economic and Social Affairs. But there are many studies—particularly after the 9/11 when the US commissioned many of them to look at this aspect—that debunk that poverty leads to extremism or lures people to such organisations. But, in many of these studies, one thing was constant: inequality and economic conditions often work as a fuel to the extremism brewing inside an individual. Last year, the Jammu and Kashmir government became the first state to declare a universal basic income scheme to fight poverty and prevent youth from joining militancy. The scheme is yet to begin. 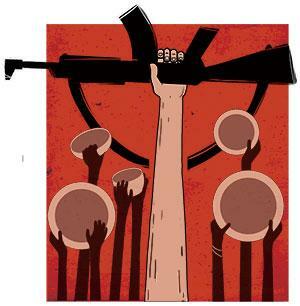 But it is time India’s policymakers and strategists took note of the linkages between poverty and conflict, instead of just adopting a military mode of solving it.